If we step on the paw of a dog or cat is sequels. If someone steps on our toes or we close a door on our hand we make a sound that says; “that hurts!” Often we use an expletive, four letter words we would not use unless something is really painful physically. Horses do not do this. They communicate very little with sound. The reason for this aspect of their evolution is the wide open spaces the wild horse herds existed in until rather recent history. Additionally, as they are prey animals (eaten by predators), they did not want to make many sounds as that might alert a lion or some other carnivore that a possible dinner was in the area. Their vision evolved from this existence in vast, open spaces as well. They see very good detail of movement that is far away as well as noticing all detailed movement that is relatively close to their proximity. Perhaps a wolf is hiding behind a rustling bush. Thus, it can be easily understood that the language of horses has evolved via their sight rather than making sounds to communicate. Their acute senses of sight, hearing and smell were a result of their big, open environment and the fact that they were hunted and eaten by predators and the horses needed to be able to see, hear or smell a predator lurking in their area. Their developed senses helped them to survive. We will focus on the importance of ‘sight’ for now. Humans initially familiarize themselves with their surroundings via their eyesight. Person to person communication has hearing as its main functioning sense because we primarily use a verbal language. For the horse the medium of communication for individual to individual, or individual to the group, uses the language of the body as perceived by their sight. Theirs is a visual language based on body postures and bodily displays with more variations than there are words in all dictionaries in all languages. 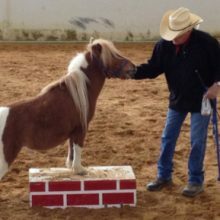 If humans are not conscious and aware of this fact and understand at least some of the meaning our various physical postures and movements have for horses, it is easy for us to communicate incorrectly, inaccurately, improperly and unintentionally alienate a horse that we want successful activities with. Unfortunately, humans do not seem to exhibit self-awareness of their movements most all the time and especially when around horses. Living unconsciously of our physical and even mental and emotional states produces huge gaps in communication, enormous misunderstandings, much unhappiness, stress and suffering for humans. When we are unconscious of what our body is conveying to our horses we create fear, because horses believe and react to what they see and sense from the humans around them. Many people I speak to have not heard of ‘The Golden Rule’ which is actually biblical in its origin. This rule says: do unto others as you would have them do unto you. Treat others as you would like to be treated yourself. This implies and necessitates that we be conscious of how others respond or react to how we are speaking and behaving so as to show kindness, thoughtfulness, respect and a desire for a good experience for all. What I see is mostly behavior and communication that is self-serving, self-centered and with the intention of us getting something or showing ourselves to be superior to others. When we communicate unconsciously with horses, we create fear, separation and non-cooperation. Today horses are our captives. Their existence in vast, open spaces is over. They live in cells mostly, with no freedom of choice and little real freedom of movement. In fact, it could be said that the domesticated horse is not much more than a well-kept slave. Many of us love our horses. But, it is expected to perform on demand, be obedient, submit to the will of humans and punished if it disobeys or shows resistance to compliance because of fear which we often misinterpret as the animal being stubborn or bad. I find this a very sad commentary on human compassion, kindness, awareness and the lack of desire to really understand this noble, magnificent creature that is the horse. Our focus is on us riding our equine servants, winning ribbons, trophies and accolades which enhance our egos, often times at the expense and to the detriment of our horses. Equines, when communicated with appropriately with kindness, respect and with precise understanding of the animal and its language, will actually partner with and follow a human to, through and over something that normally would scare it so much that running away as fast as possible would be its only reaction. So, the question might be asked: “How can we communicate with horses in such a way as to develop this sort of trusting partnership?” The answer is relatively simple. It begins with a desire to not always put our big agenda ahead of the horse and to understand how a horse perceives the world around it and its responses to those perceptions. It does this through sight. It observes and sees every movement that is made around them. This means that if a human enters the personal space of a horse unconsciously and reaches to the animal’s nose to pet it (something the vast majority of humans do), the horse’s reaction might be a fearful one. A fearful reaction can mean the animal could possibly bite, kick or somehow defend itself from this uninvited individual’s intrusion into its space. This would be an instinctive reaction by the horse so it feels it will survive the invasion and its defensive act is not deserving of punishment. We must not be unaware or unconscious of what we do with our bodies when around horses. They notice where we are looking, which is mainly at their face unfortunately. This can seem aggressive to the horse. They notice our posture and how we move our arms, hands and legs and they react to that stance and movement. What we do with our bodies and how our emotions are when near horses communicates to them. This communication either produces feelings of safety within the horse or feelings of fear. Our emotions are often displayed through our bodies. This should be easily understood. We are also very unconscious of this fact. Again, self-awareness becomes an essential ingredient for successful communication with horses. When we are angry, stressed, hurried or unsettled emotionally, our bodies show it through how we move. The horses see this movement and interpret it relative to their feelings of safety or fear. Here are a few general suggestion of how we humans can appropriately and effectively use our bodies to successfully communicate to our horses. First, as the animal generally sees you near it, be thoughtful in your approach by moving slowly towards the animals shoulder and not its head. Keep your arms down and speak calmly, thoughtfully and reassuringly as you approach the horse. Do not reach into the animal’s face. It is better and safer to gently stroke it on the neck, shoulder or give a gentle scratch on the withers. Horses greet each other and humans by bringing their noses to them. The animal is not saying pet my nose or face. It is investigating who is there and greeting them the way horses do. When the animal does this keep your hands down or offer the horse the back of your hand to sniff, keeping your hand low. This is safer for you and the back of your hand is a more benign position of the hand for the horse. To reward a horse for anything it does that you like, immediately take a step away from the horse. Being close to the horse puts pressure on it. Backing away a step removes the pressure and rewards the horse for having done something you want. This principle of immediate reward by removal of pressure will work successfully through all training with horses. Additionally, learn to develop ‘soft eyes’ when with and around horses. Soft eyes see more of the peripheral space (i.e. the whole horse) we are in. Very focused, somewhat piercing eyes are predator like. Soft eyes are kinder eyes as well. There is an old horseman’s expression that says: “this horse has a kind eye.” It means the demeanor of the animal is gentle. It means the same for us. Self-awareness helps us to improve our communication with horses when riding them as well. Horses ‘see’ their riders through how that rider feels through the body of the animal. The horse will feel as the rider does. It feels what that rider is feeling. Our thoughts, feelings and emotions are communicated to the horse through our bodies to theirs. In this way they see their rider. Even softening our eyes and breathing consciously, when we ride, helps our bodies to relax and helps the horse to relax at the same time. Additionally, a horse can ‘see’ (feel) its rider being out of balance which likely creates fear within the horse. When a horse sees with its body a balanced rider it is less likely to be spooky, nervous or fearful. This provides the possibilities for better performance. Again, self-awareness is seen as a huge component to success.